BANCONMIGO. 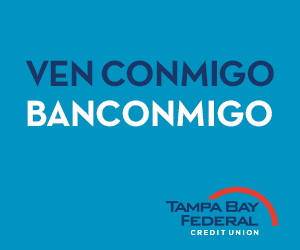 It's our way of describing that sense of community and family that can only be felt by banking with Tampa Bay Federal. Would you like to learn more? Complete the form below. *All loans are subject to Tampa Bay Federal lending policies. Cash back incentive of $600.00 for a vehicle loan $30,000.00 or more; $400.00 for $20,000.00 or more; and $200.00 for $10,000.00 to be paid to a Tampa Bay Federal account during loan closing. Restrictions Apply. Offer, rate, and terms are subject to change without notice. Not valid to refinance existing Tampa Bay Federal vehicle loans. Limited time offer. If you participate in this offer, you may receive Form 1099 MISC at year-end for tax purposes. Must have a Tampa Bay Federal checking account to recive cash backpromotion. Individuals must meet all membership requirements to qualify. Loan must close directly with Tampa Bay Federal location. (includes branch, contact center or online). Not valid for loans financed with Tampa Bay Federal through dealership. Loan requires set up of automatic payment or ACH for payment.